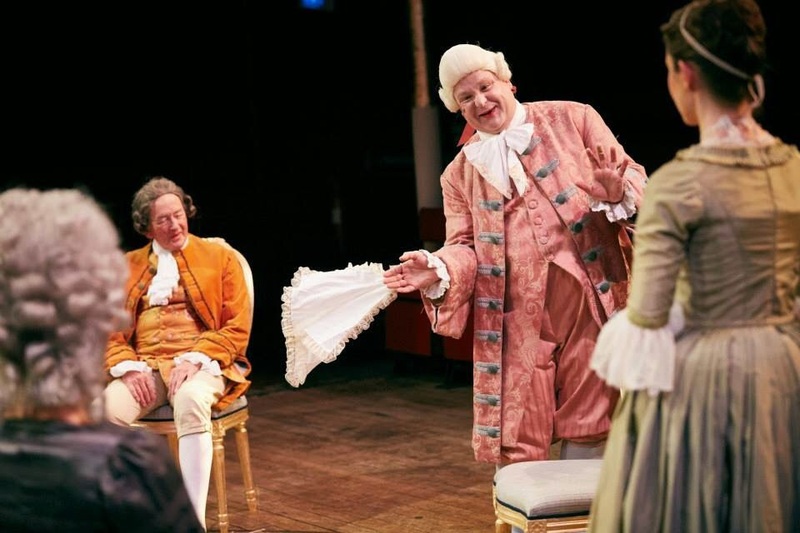 Written in the 1770s by Richard Brinsley Sheridan, The School for Scandal is an entertaining and comedic portrait of London’s aristocratic society of the times. Arguably the era that paved the way for celebrity as we know it, that society was perceived by Sheridan to be duplicitous and gossiping, thrilling and conniving. Returning from twenty years in the East Indies, Sir Oliver Surface is now to decide which of his nephews, Joseph or Charles, should be heir to his substantial fortune. Cue more deceit. With a troupe of twenty actors, Shakespeare at the Tobacco Factory brings to the main auditorium Sheridan’s 240 year old play with confidence and an eager sense of fun, earmarked from the off by Byron Mondahl’s prologue in his brilliantly camp character of gossipmonger extraordinaire, Sir Benjamin Backbite. Invited to consider that, in this age of smartphones and social media, we each have an unlimited ability to be scandalous blabber mouths at the mere touch of our screens, Mondahl sets the scene for a humorous insight into the malicious side of human nature. The cosy clique of high society gossipers that busies itself in Lady Sneerwell’s boudoir is at once delicious and repellant. Fiona Sheehan’s muck spreader, Lady Candour, is fabulously feline – sly, sleek and woefully believable, forever battling for the juiciest version of the latest story with the easily ruffled Backbite and his uncle, the ever-so-posh and authoritative Crabtree (Benjamin Whitrow). Julia Hill portrays Lady Sneerwell as a sad character indeed, vindictive yet seeming to take little pleasure out of her smear campaigns, as if they were fundamental to her very being, those falsehoods her only reality. And Paul Currier’s horrid Snake embodies Sleaze itself – this fellow is a Fleet Street-esque lurker and a ne’er do well. For me, the gossipers are central to the play. Although they aim to fabricate and/or publicise scandal about others, they don’t so much invent lies but construct an exaggerated caricature of already spoilt and privileged individuals. I didn’t much like any of the characters, though all are well cast and soundly performed. Pappa Essiedu has the edge with his Joseph, a dislikable young man, played with wit and sophistication and I feel sure that Essiedu is an acting talent to watch. Likewise, Daisy Whalley is convincing as the sweet, ultra-demanding, prickly young wife who spends more on a basket of flowers than a mid-eighteenth century laundry maid could have earned in a year. Sickening, isn’t it? 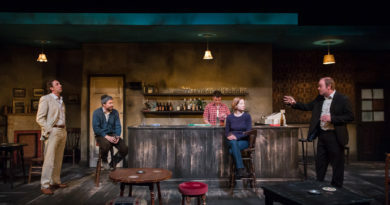 But, like Romeo and Juliet before it, The School for Scandal is a veritable team effort by those both on and behind the stage and is pulled together in all the right places, as so often at SaTF, by Director Andrew Hilton. The real star, though, is Sheridan himself and I’m thankful to this exciting theatre company for bringing him to my attention: it was huge fun to be immersed in Georgian England for two and a half hours. And this may have been written beyond a few generations ago but it is disquieting to think that, after more than two centuries, society has done nothing to silence vicious and slanderous tongues. Indeed, in these days of reality television shows and sensationalist journalism, it would appear we’re getting generically more bitchy. Shame.